1. Remember to check the straps of the carrier regularly throughout your trip. 2. Pack the cargo bag full so that the sides are pulled tight to prevent excess material from flapping in the wind which can damage the rooftop carrier and cause the load to shift, loosening the straps. 100% WATERPROOF MATERIAL: Our durable rooftop cargo bag is constructed from 100% waterproof anti-rip, anti-peel, and anti-crack fabric with ultra-strong dual seam technology . Allowing your trip experience more reliable anytime to anywhere even under the hard weather condition. 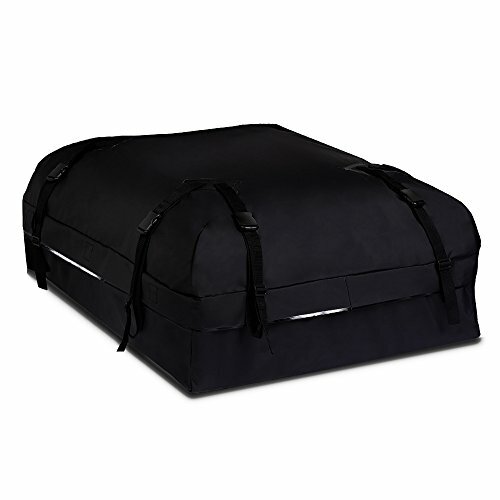 UNIQUE DESIGN: This rooftop cargo bag built- in 8 heavy-duty thick straps( 0.59inch ) made with soft-durable material that secure your stuff easily on rough road and no problem with noise for traveling or off- road . HUGE CAPACITY OF STORAGE: The 13 Cubic Feet storing capacity maximize your vehicle's cargo space that is very convenient for you to put luggage, sleeping bags and other travel needs of large items placed in the roof rack cargo bag. Easy to store ，it can be easily folded and placed in a storage bag for only a small space when not in use . EASY TO INSTALL: Our auto rooftop bag has strong nylon straps with buckles which can easily attach to most cars, vans or SUVs with roof rack systems.The space between the car side rails or the crossbar and car roof cannot be less than 0.59inch. OUR PROMISE & GUARANTEE: You'll get a full 1-year warranty against any kind of defects in material and workmanship. BUY WITH CONFIDENCE！If you have any questions with our auto top cargo bag, please feel free to contact us. If you have any questions about this product by Boltlink, contact us by completing and submitting the form below. If you are looking for a specif part number, please include it with your message.